This is one of the sweetest, most unique baby girl ornaments we've come across. 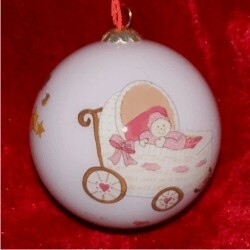 We're happy to offer the baby buggy for girls glass ball personalized Christmas ornament at a price that is well below what its quality and beauty suggest. The cute scene is hand-painted on the inside of a clear glass ball, so it will look just as lovely in the decades to come. We add our display cord to the baby buggy for girls glass ball ornament, so parents and grandparents can display it to best effect. We carry quite a few products from the same artist, and you'll find them by perusing our engagement, expecting, family and baby ornaments personalized by our calligraphers. Sweet and Pretty Nov 11, 2014 Marlene K.